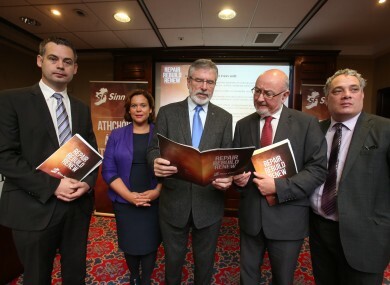 Sinn Féin launching its pre-Budget submission at a Dublin hotel this week. THE LAUNCH OF Sinn Féin’s pre-Budget submission this week brought with it an avalanche of Fine Gael and Labour press statements poking holes in their numbers and claiming there would be all sorts of terrible consequences if the opposition party’s policies were implemented. One criticism was that the Sinn Féin proposal for third tax rate of 48 per cent on income over €100,000 would mean that some people would end up with a whopping 73 per cent marginal tax rate when Universal Social Charge (USC) and PRSI are included. This contrasts with the current 52 per cent top marginal rate of tax which the government has given a firm commitment to reduce in the Budget to be announced next week. Taoiseach Enda Kenny levelled the ’73 per cent tax’ charge in the Dáil on Wednesday afternoon and then repeated it on Thursday (although he appeared to misspeak on that occasion as he said it would be 78 per cent). The accusation comes from the work of Fine Gael number crunchers who are taking into consideration not just Sinn Féin’s pre-budget submission this year, but its documents from the past three years where the 48 per cent third rate has been included as part of the budgetary arithmetic on each occasion. Fine Gael claims this means that if Sinn Féin was in government it would have introduced a third rate of tax at 48 per cent in the first year and then increased it by seven per cent in the following two years in order to continue to make the savings outlined in their budget documents. “They don’t seem to be aware that you only get the extra revenue the first year after you have introduced such a tax increase,” a Fine Gael spokesperson told us this week when we queried the 73 per cent claim. To get down to the numbers, Fine Gael’s contention is that the top marginal rate of tax under Sinn Féin would, in the first year, be 48 per cent + 7 per cent Universal Social Charge + 4 per cent PRSI. That equals a 59 per cent marginal rate. Then in year three, the top income tax rate of 55 per cent would have another 7 per cent added and another 11 per cent in USC and PRSI bringing you to the magic 73 per cent. So how then does the party propose to make the savings it has outlined in its last three pre-Budget documents? Well, Sinn Féin argues simply that if it were in government it would be pursuing not just the introduction of a third rate of tax, but other revenue raising policies such as its wealth tax proposal, which is not included in its arithmetic because it can’t be costed by the Department of Finance. In fact there are a number of policies in the Sinn Féin documentation that can’t be costed by the Department which is part of the reason why pre-Budget submissions can often be interpreted in different ways and other parties can poke holes in them. Put simply, Sinn Féin does not see it’s last three pre-Budget submissions as part of a three-year strategy, whereas Fine Gael and Labour do interpret them this way. This isn’t surprising given the two coalition parties have pursued their own three-year strategy in government since 2011. This makes it easier for the two government parties to be critical of the opposition’s proposals. After all it’s much easier to have a go when you are in a position to see the impact of your policies, while we have no idea of the economic impact of Sinn Féin’s proposals other than the interpretations of economists who often take differing views. What would help in all of this debate is if budgetary proposals from opposition and government parties could be independently costed and analysed to determine what kind of impact they would have on the economy. In the UK there is the much-lauded Institute for Fiscal Studies which frequently analyses economic proposals from the main political parties there and presents an independent assessment of their merit. Here we have the Fiscal Advisory Council, set up by the current government, but the legislation underpinning its establishment means it is restricted from analysing political parties’ proposals. In an interview with TheJournal.ie in June, Sinn Féin’s finance spokesperson Pearse Doherty said he would welcome independent scrutiny of his party’s proposals. “If we had an independent unit that would do that on behalf of political parties and independents then I believe that would be of huge benefit to the public debate and discourse that we’re having,” he said. As the debate over ‘Shinnernomics’ looks set to continue in the run-up to the next general election, such an independent costing unit might be necessary to move beyond the current back-and-forth political debate where parties interpret proposals in different ways to suit their own agenda. Email “Is Sinn Féin really proposing a 73 per cent tax rate? ”. Feedback on “Is Sinn Féin really proposing a 73 per cent tax rate? ”.